Technology rules the world, but there are very few women making decisions at technology companies. IBM has 20 executive officers, and three of them are women. HP has 14 members of its executive board and three of them are women. Dell’s executive leadership team has 12 members, one of them a woman. Microsoft counts a whopping 125 executives, 13 of whom are women. Oracle has 26 executives, with five women. 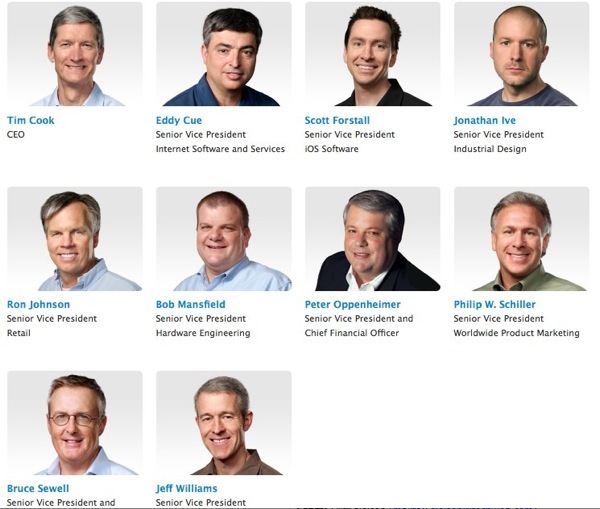 Apple counts 10 among its executive team and none are women- they are pictured below. My question to you, how can more women become executive officers at technology companies?